The kitchen is one of the places in the home consumers interact with packaging most frequently. It also is a source of frustration for consumers because of packaging that spills, leaks, requires a spoon to access the product, or provides no way to close the package. Here’s a round-up of six products that provide a cleaner way to access food products with less mess. 1. One of the world’s favorite chocolate-y condiments, Nutella, is now available in a squeezable bottle. The only problem is that you no longer have an excuse to lick the spoon. 2. Breaking out of the can, Heinz tomato-based beans is available in a “fridge pack” with a lid that, unlike the tin can, allows you to reseal the product. 3. Campbell’s cream stock comes with a plastic closure that allows you to seal the product between uses. 4. The Flavor Infusers from French’s have a unique top to allows you to better inject the marinade into your meats without a messy baster. 5. No need to dig into the large tub of yogurt with a spoon. This carton from Activia provides an easier way to pour yogurt for all your cooking needs. 6. Pons extra virgin olive oil for kids comes with an easy dispensing spout to prevent the normal glugging (and spilling) of olive oil. We’re always looking for packaging inspiration. 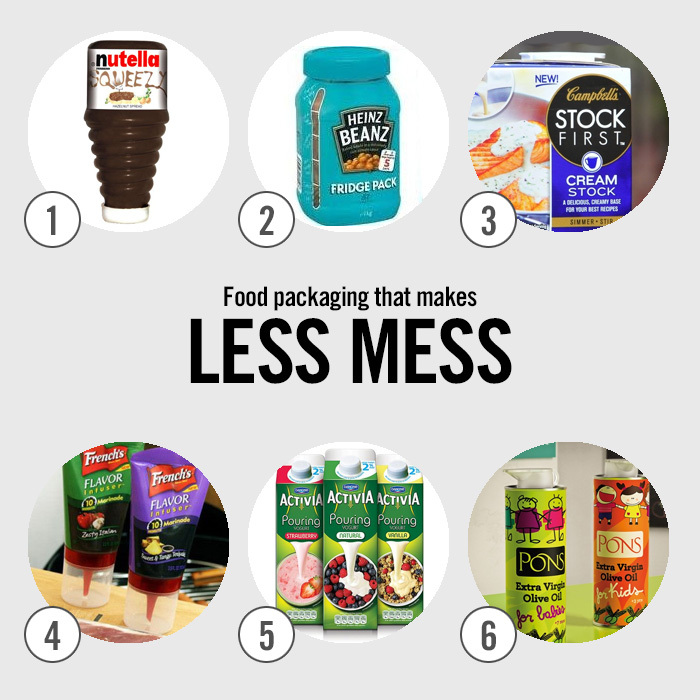 See more of our favorite Less Mess packaging solutions on Pinterest.